Come and discover Le Touquet on the Northern French coast. 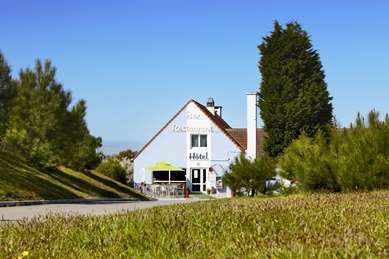 Stay at the Kyriad Le Touquet - Etaples hotel for a hassle-free and relaxing break. The ultimate destination for sea-side chic in the roaring twenties, Le Touquet started as an isolated moor. The land was put up for sale by the government and bought by two French businessmen who eventually saw its potential as a holiday resort. It acquired the status of a town – Le Touquet Paris-Plage in 1912 and continued to attract a select and wealthy clientele from Europe and beyond both before and after the World Wars. The town and resort on the Opal Coast have continued to expand and evolve whilst still retaining their quaint, rustic charm. It has become a place of particular interest for architecture lovers, particularly as strict building regulations in the 19th century meant that architects had to be creative in their designs. Nicknamed ‘Paris by the sea’ in its original heyday, the town now has plenty of modern amenities to enjoy and by choosing Kyriad Le Touquet-Etaples hotel, you’re sure to have a memorable trip. Only in Le Touquet for two days ? Make the most of them and take in the beautiful forest and seaside surroundings on a sight-seeing bus. Then, why not climb the 274 steps of the lighthouse to get a birds-eye view of the resort ? To top off your trip, visit the Gallery behind the Dune, which houses contemporary local art in its 300m2 show-room. Seven nights in Le Touquet can easily be filled especially as the resort boasts such great sport and leisure facilities. Spend some time relaxing with some seaweed therapy in the Thalassotherapy spa before taking in the delights housed in Le Touquet’s museum, including signed photographs taken by Parisian art editor Edouard Champion. The resort boasts fantastic golf courses and as well as other sports facilities. Finally, why not have a flutter at one of Le Touquet’s casinos. Sailing, surfing, biking, swimming and so much more – Le Touquet is ideal for tiring out children on their summer holiday. Spend the day at the biggest water park in northern France – Aqualud, just a short drive away from the Kyriad Le Touquet-Etaples. Try some mini golf as a light-hearted alternative to the real thing or let the family loose in the Equestrian Park for some horse riding or pony-play. There’s so much to explore, you won’t know where to start. Le Touquet is served by Le Touquet - Côte d'Opale Airport with flights provided by LyddAir. Travelling by car with the ferry to Calais or using the Eurotunnel are also options. The nearest train station is Etaples, which has connections from Lille or Paris. The resort is best explored by car, foot or bike. As with other French towns, food plays a major and satisfying role in the run of the day and, with its sea-side location, the restaurants of Le Touquet are well placed to pick up the freshest ingredients. There are a good selection of restaurants ranging in price and style. For a real and authentic treat, stop by at Restaurant Perard for a bowl of rich fish soup. For over 30 years, the sandy dunes of Le Touquet have been transformed once a year in February for the Enduro Motorcycle race. Over 1000 motorbikes and quad bikes participate along the 16km course, which stretches from the Aqualud along the beach all the way to Merlimont. The event attracts more than 250,000 spectators and is a local highlight. Proprietor of Restaurant Perad in Le Touquet, Serge Prerad lays claim to the invention of fish soup. His soup, whose secret recipe has been perfected over a number of years, can now be bought in most French supermarkets, but even better, it is still served in Le Touquet where it originated.